An Israeli doomsday group sworn to protect the nation's atomic stockpile stores their charge in the desert, but a group of ex-Nazis know their secret. Fanatics face fanatics as Remo and Chiun sort through the desert madness. With their cover blown, can the skills of Sinanju be a match for a blast of cataclysmic proportions? 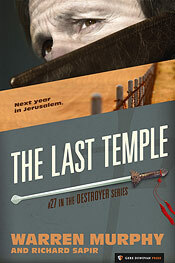 The clock is ticking as the Destroyer races to save the Holy Land.